Today is the spring equinox, where, physically speaking will be the day when the sun reaches the highest point. As you know, our orbit (the Earth) is an ellipse in the sun, and, in addition, in the horizontal orbital, Earth is tilted. What physicists consider an inclination of the ecliptic. So far, all right. Due to this inclination and rotation of the Earth, the Sun travels an arc from that “born” until “die” every day. That is, not “sale” at 90 degrees from the horizon, but on the time of year, those approaches 90 degrees or vice versa. And the inclination depend on whether the northern hemisphere or south, still, 90 degrees using a mirror of that inclination. 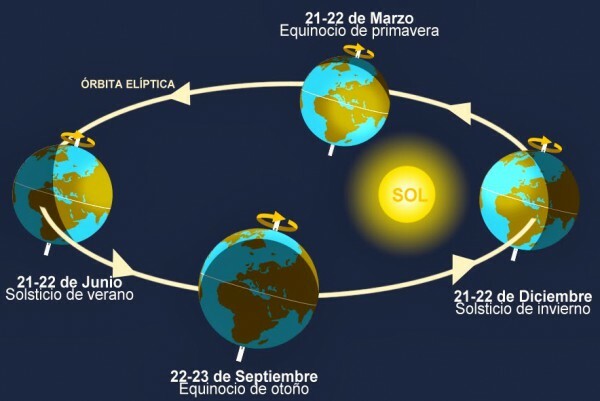 Today, on the spring equinox, is the time when the sun tends more to those 90 degrees, is when this “highest” all year (which does not mean that there are more hours of light) as being a elliptical orbit, speed is not constant and if it is a “bell”. That is, at dawn and at dusk is when faster moving and when this highest is when slower this. In summer, this is going slower than now by eccentricity of the Earth, hence there are more daylight hours. At this time, this event, many attributed magical powers due to lack of knowledge. Thus, in many cultures days of harvest and gathering and other religions they are celebrated, appropriated facts, myths and cultures of others to put over their religion (eg Christian). Hence we are now Easter. A common method of relegating other beliefs and impose his own. The only good thing (now) is that being a physical and mathematical phenomenon can foresee with great accuracy (day and time, it has been today at 4 am, approximately) knowing that more science and more knowledge act better and know better what happens, something that religion can not do since her departure “already knows and knows everything”, something that goes against the human being, the universe, life and, therefore, nature itself that He claims to defend (religion). So you know, more science and less religion. Sorry for the image, is in spanish, my mother language.